With one of the most extreme winters in recent years, pickup sales have dramatically increased over the 2013-2014 season. Drivers from the northwest all the way to the northeast have been buying up 4×4 pickups like homeowners buy bread and milk in preparation for a winter snowstorm. The surge in sales shows that drivers are realizing that the 4×4 is the best defense for roadways packed with snow and black ice. Here are some of the biggest reasons that pickup sales have exploded this winter season. Drivers in states like Wisconsin, Illinois, and Michigan, have seen their share of winter stores already during this 2013-2014 season. The storms appear to be lining up one after the next to pummel areas with a blanket of snow. Drivers who need to travel to work are realizing that without a 4×4 pickup truck they can not consistently get back and forth to work safely. During many of the recent storms the temperatures have stayed below freezing for extended periods of time. Driving a car on these types of roads can not only be treacherous, drivers could be stranded and without a vehicle for days. Purchasing a new 4×4 pickup gives many drivers the confidence to be able to navigate those icy roads when many car owners are staying home from work. Drivers also express concern when the roads are cleared during the day, that by the time they get back on the road for the commute home, black ice has taken over and made the roads extremely dangerous. Even cars with front wheel drive have difficulties handling black ice conditions. New 4×4 pick up trucks can give drivers the confidence and piece of mind to be able to navigate icy roads safely and get back home without doing any significant damage to the vehicle. Car dealers have also seen a huge surge in 4×4 pick up sales to independent contractors in the northeast who use the vehicles for plowing snow. 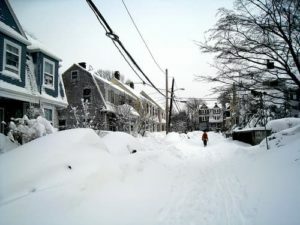 This has been one of the snowiest winters in the Boston area, and many companies have been unable to keep up with the mounting snowfalls each week. Many landscaping contractors stop in and purchase new 4×4 pickup trucks that they use during the winter to make extra money when business is slow. These contractors are finding that even with a fleet of trucks mounted with snow plows, they can not keep up this season. The season is expected to continue to break records with snowfall totals and frigid temperatures. There is no sign of a slow down in 4×4 pickup sales this winter season.